Air pollution deposition comes from various sources, including smokestacks, fires, pesticides, and automobile emissions. Chemicals and compounds that are sent into the air from these sources fall back down to earth directly or via precipitation. gets in the water. Then it contaminates the fish. We eat the fish and mercury gets in us. One of the notable sources of mercury is from power plants that burn coal. Railroad cars like this one empty their tons of coal at power plants all across the nation. and with a 250-year supply, coal is going to be the primary fuel for a while. the energy mix, but we need to reduce pollutants such as mercury as much as possible. enough soon enough, but the electric utility industry disagrees. won’t make that much difference. for the mercury in your fish. “You blame the sources that are close by and you blame the sources that are far away. And since Great Lakes fish have elevated levels of mercury, sooner would be good. return to more normal levels. really didn’t need one. She says couldn’t avoid noticing the pollution in the air. operated by Minnesota’s leading supplier of electricity, Xcel Energy. quality problems they believe are caused by Xcel’s older plants. gas. 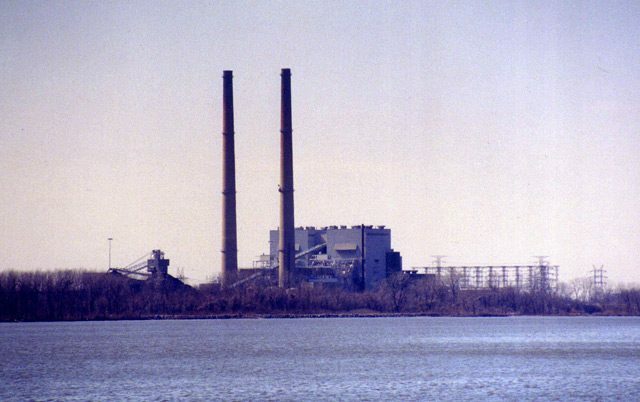 The oldest plant, Riverside, lies in northeast Minneapolis. subject to federal environmental mandates. would require it to reduce emissions. group. He says that’s why Excel’s decision to convert Riverside to natural gas is such a big deal. got into the food chain and contaminated fish. Green says the pollutants don’t go away. They just end up contaminating the air and the water. drunk driving and homicide combined. Ron Ellsner is the project manager for Xcel’s proposal. day for her power bill will be worth it. Lakes region to do the same. For the Great Lakes Radio Consortium, I’m Ann Alquist. experts warn that fish from lakes and rivers can be contaminated by pollutants. these people have always relied on fish for a large part of their diet. pollutants could harm development in children and fetuses. the immigrants had never heard of such a thing as contaminants you couldn’t see. people. They feel if that can’t see something wrong with the fish, it must be okay to eat. immigrants and handed them out at every opportunity. Josee Cung to try to explain the fish contaminants issue. important not just to talk to the anglers who got the fishing license – usually men. agreements, has been admonishing the states and provinces to do more. the message to heart, but finding the money to do the job is always a problem. harder to reach cultures, such as those from Southeast Asia, that rely heavily on fish for protein. There’s a trend among some Native Americans. They’re trying to return to more traditional diets. more healthy for Native Americans. 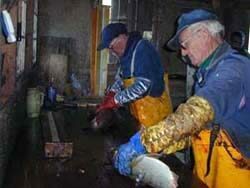 But it’s become clear that some of those foods, particularly fish, are contaminated by pollutants. 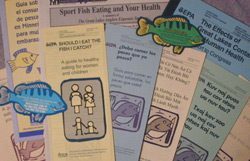 reluctant to discourage people from eating fish, even if it’s contaminated. mercury in fish. But, Pursell says there’s a balance that has to be considered. present in the foods people in the tribe would eat instead of fish. eat the healthier food, fish. dealing with the health problems among Native Americans. Native Americans can avoid the contaminants that might be present in traditional foods. time, she says there’s a limit to what she’ll recommend. “You know, I can’t tell people to stop using fish for ceremonies. I just can’t do it. I won’t do it. contamination from pollution, will the food you eat instead be any more safe?